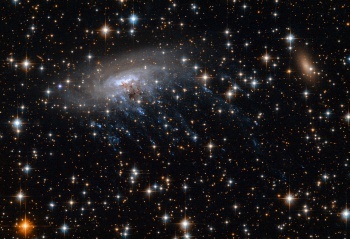 A new image taken by the Hubble Space Telescope shows a spiral galaxy spilling its cosmic guts under intense pressure. Spiral galaxy ESO 137-001 may deserve the more dramatic nickname "The Wounded Galaxy" now that a recent image captured by the Hubble Space Telescope shows distinct blue streaks trailing behind it as it moves through the heart of galaxy cluster Abell 3627. Similar in appearance to blood trails left by a wounded animal, these blue streaks, which actually represent ultraviolet light, are hot young stars encased in wisps of gas being torn away from the spiral galaxy by Abell 3627. The process is known as ram pressure stripping, a drag force experienced by an object as it moves through a fluid. In this case, the spiral galaxy is moving through the superheated gas in the center of Abell 3627. Other, less visible signs of the drag forces include the curved appearance of the spiral galaxy, as well as displaced brown streaks of dust. As the spiral galaxy continues to move through Abell 3627 and experience these drag forces, most of its cold gas will be stripped away. This gas is essential to star formation, so the galaxy will be left effectively barren, incapable of forming new stars.